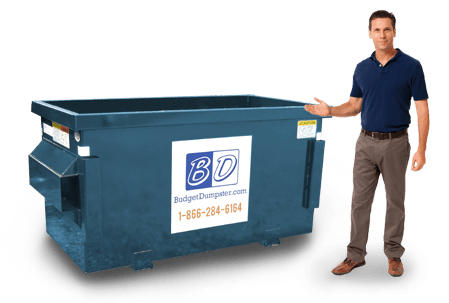 Finding the right dumpster for your business is no small matter. There are a number of things to consider, from the typical volume of waste throughout the week, in addition to the type of trash you are throwing away. Then there's the various options of how to handle that trash, whether or not you want to opt for the extra service of recycling or just leave that to each individual employee to do of their own volition? 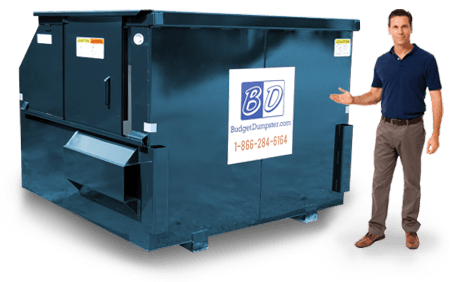 Fortunately, Budget Dumpster streamlines these questions for you so you can get your commercial trash collection service up and running in practically no time at all. When you are ready to get started on your waste removal, just give us a call and we'll be there in no time to get your dumpster situated. Here's how it goes; as soon as you call to get a quote, we'll run you through the size options available to you. Once you've picked the right size dumpster, we'll go ahead and setup a pickup schedule that's to your liking. At present, we offer weekly, biweekly, and even monthly pickups, depending on your waste stream. Just let us know which works for you and we'll have a garbage truck rolling out to you! Which Size is Right for My Business? 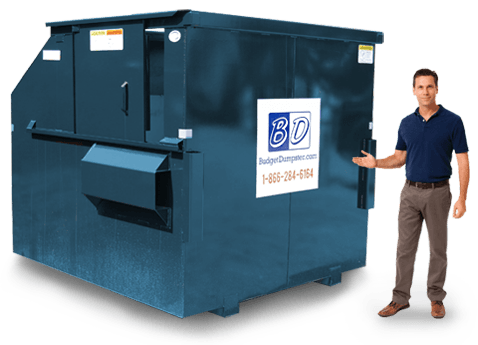 There are four different sizes to choose from when renting a commercial dumpster with us. They range from the small and compact 2-yard size up to the giant 8-yarder. 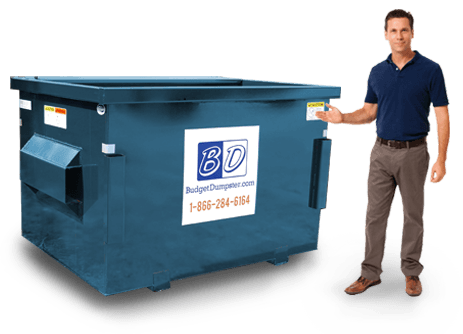 If you've never rented a permanent dumpster before, it can be difficult to know which one to choose. Consider how much trash you will have on a weekly basis, how much that trash will weigh, and how big your trash is. You can then look at the dimensions and weight capacity of the different sizes. If you're still unsure, don't be afraid to ask one of our representatives for advice. We're here to help! The smallest is the 2 yarder, which is great for small offices or businesses that have few employees and a low trash flow from week to week. The next size is the 4-yarder, which is a perfect "medium" size for small retailers or medium restaurants. The 6-yarder is our most popular and versatile option, for larger offices, retailers, and restaurants. Then there is the largest 8-yarder, which is perfect for warehouses or distribution centers. Whichever size you choose, we know you'll be happy with your service! For many, renting a dumpster is unknown territory. We're happy to let you know we are here to help you navigate the industry. Our customer service representatives are extremely knowledgeable and want to help you get the best deal for your needs. Customer satisfaction is our number one priority. So ask all the questions you want and we'll talk you through everything until you are understand completely and are comfortable with your rental contract. You don't want you to ever have to worry about your trash service, and we'll make sure it happens!